Here we see an outline of the information required to perform the strategizing and Roadmapping phases that constitute “doing” Enterprise Architecture and forms the basis for a project to perform the required work. The information flows into the portfolio of projects that effect the change defined by the roadmap. ¨ The Physical World, essentially defines what the current capability model is. ¨ Projects defined by the Transformational Roadmap, modify this real world, and by doing do deliver the Target Capability Model. ¨ The Target Target Capability Model, in turn, delivers the Target Operating Model and the Objectives from the Business Motivation Model, both of which are driven by the Current Operating Model. 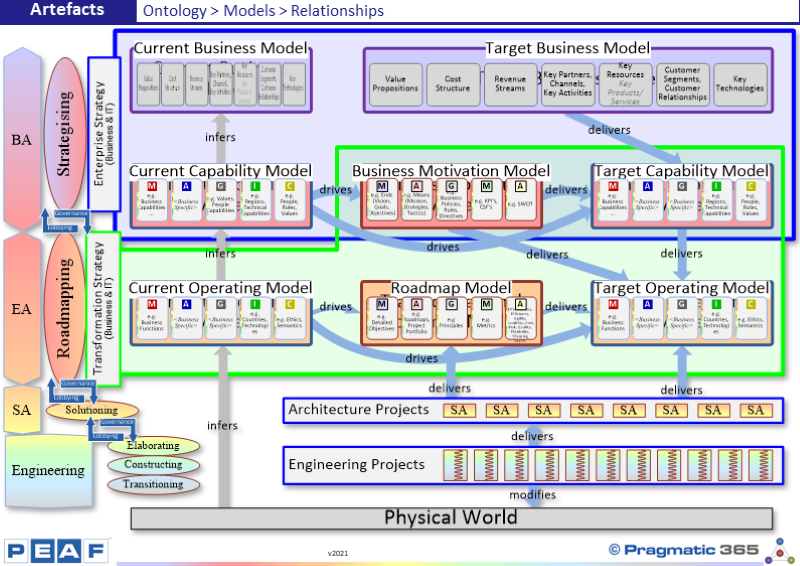 ¨ Thus, the Target Operating Model ultimately delivers the Target Business Model. To initiate the work. a Project Brief (PRINCE2) or Project Charter (PMBOK) is required. “…the document issued by the project initiator or sponsor that formally authorizes the existence of a project and provides the project manager with the authority to apply organizational resources to project activities. ¨ Used to discuss and document how the Enterprise will generate revenues and make a profit. It explains what products or services the business plans to manufacture and market, and how it plans to do so, including what expenses it will incur. ¨ Comprises information such as Customer Segments, Customer Relationships, Channels, Value Propositions, Cost Structure, Revenue Streams, Key Activities, Key Resources, Key Partnerships. ¨ Created by the board supported/facilitated by the EA offering structures to capture the information and ensuring the result is complete and consistent and raising Technology catalysts where appropriate. ¨ Comprises information such as Vision, Goals, Objectives, Mission, Strategies, Tactics, Business Principles, Policies, Rules and Standards. ¨ An abstract or visual representation of how an organization delivers value to its customers or beneficiaries as well as how an organisation actually runs itself. It is the highest level structural view of the Enterprise. ¨ Comprises information such as Business Functions, Products, Information, Ethics, Roles, Countries, Technologies (including but not limited to Information Technology). ¨ Created by the EA with the board. ¨ Describes the complete set of capabilities an Enterprise requires to execute its Business Model and fulfil its mission. ¨ Comprises information such as organizational level skills embedded in people, processes, and technology. ¨ Created by the EA. ¨ Describes the programs, projects and initiatives needed to change the Methods Artefacts, Culture and Environment of the Enterprise from the Current state to the Target state in order execute the Enterprise Strategy. ¨ Comprises an interrelated set of projects programs and initiatives related to the Target Capability model Principles, Policies and Standards used to guide them. ¨ Industry standard used: PEAF – Principles. Since the way “doing” Enterprise Architecture (aka Strategising and Roadmapping) is the same regardless of the Enterprise type, Pragmatic provides a default Project Brief document and PowerPoint briefing presentation, that contains 95% of what is required to initiate the work. Do these models and relationships agree with those used by your Enterprise? What does your Enterprise use to express each of these models? Is it clear to the people in your Enterprise, what these models are and the dependencies between them?